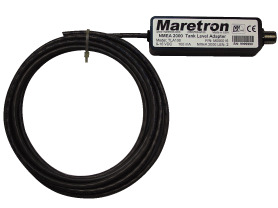 The TLA100 is used to adapt commercially available resistive tank senders to the NMEA 2000? network. This allows you to observe tank levels anywhere on the vessel where there is an NMEA 2000? compatible display such as the Maretron DSM200. The TLA100 is compatible with both the American standard (240-33 ohm) and the European standard (10-180 ohm) resistive senders. In fact, the TLA100 can be calibrated for any resistance between 0 and 300 ohms. Unlike most tank senders that only work with rectangular tanks, the TLA100 can be calibrated for irregular tank shapes so you know the true level of the tanks. You can also use the TLA100 with analog gauges so you don't have to get rid of existing gauges to enjoy the advantages of digitally networked information.